Chinese herbal tea is also known as medicinal tea. It is made from all natural herbs that are thought to relieve or cure a variety of physical ailments. It is part of Chinese herbal medicine that has been practiced for 5,000 years. Chinese herbal remedies are often concocted into a tea. What is in Chinese Herbal Tea? The tea may contain dried leaves, flowers, bark, seeds or roots of herbs. The herbs may be used singly, but are most commonly combined with other herbs to take advantage of their combined healing properties. 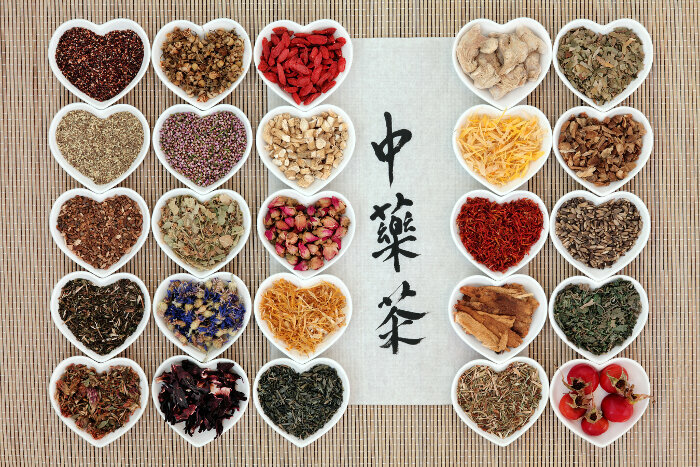 There are over 3,000 herbs in China that can be used for medicinal purposes, but only about 450 of them are routinely used. Some Chinese herbal tea may contain other minerals and nutrients derived from natural sources other than plants. The type of herbs used depends on the desired outcome. Some herbal teas are thought to reduce stress and promote well-being, while others work to relieve either chronic or acute ailments. How is Chinese Herbal Tea Made? The tea is typically made by steeping dried herbs in water that has been boiled and allowed to cool slightly, but fresh herbs can also be used. Hot water releases the oils and compounds in the herbs that are responsible for healing. The dried herbs are generally placed in an infuser, but can be placed in the pot or cup and steeped and strained before serving. Because many herbs are thought to contain healing properties or to offer health benefits, a wide variety may be found concocted into Chinese herbal tea. Recipes for herbal tea vary to allow for combining several herbs. What is Chinese Herbal Tea Used For? Where Can You Find Chinese Herbal Tea? The best place to look for genuine Chinese herbal tea is in health food stores or holistic health outlets. You may find tea labeled as Chinese herbal tea in the pharmacy or the health or tea section of the grocery store, but beware. Just because the label says Chinese herbal tea does not mean it is authentic. What Should You Look For in a Chinese Herbal Tea? The most important aspect of buying Chinese herbal tea is to purchase it from a reputable seller. Because herbal teas are not regulated in the United States, claims on the packaging have not been verified. It is not uncommon to find tea labeled as Chinese herbal tea that does not actually contain Chinese herbs. Read the label carefully and buy your tea from a company you trust. What Type of Chinese Herbal Tea Should I Get? 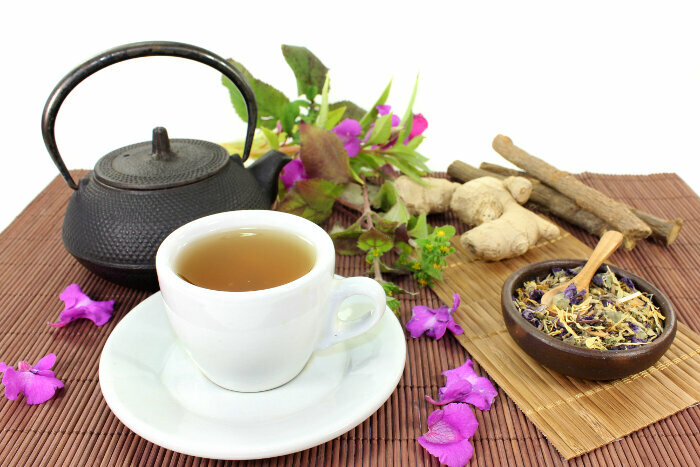 You may have noticed that there are a wide variety of herbal teas sold as Chinese herbal tea. Each is designed to treat specific conditions. Read the label carefully and match your symptoms to those listed on the container. While they cannot makes claims of curing a condition, the information on the box typically notes what conditions the formula is used to treat. Here are some common herbal teas that you may find beneficial. Asian Ginseng (Panax ginseng) also known as Red Ginseng, stimulates the central nervous system. Jiaogulan (Gynostemma pentaphyllum) enhances and protects the immune system. Reishi (Ganoderma laucidum) reduces anxiety and insomnia and promotes emotional balance. Schisandra (Schisandra chinensis) reduces anxiety and helps nervous, immune, and endocrine systems. You may have heard the term Chinese cool or cooling tea and wondered what it really is. Cool tea is a special formula that is thought to rid the body of excess heat. Ironically, cool tea is served hot and gets its name from the ailment it treats, not from the temperature of the tea. It is used to cool the body down in the summer or during a cold or fever. It is also used to detox and clear the lungs and to relieve dry and sore throats. If you are considering trying Chinese herbal tea to treat ailments or to improve your health, talk to your doctor first. Although herbal remedies are considered safe, some may interact with medications you are taking.